The secondary use of playing cards turns them into a valuable source of social documentation. Many examples of repurposed playing cards are known from as far back as the 16th century. In rare instances emergency money (notgeld) was issued on playing cards. During and after the First World War, money, especially small change, was in short supply. In Austria the towns of Reichental and Steyregg issued what we know as spielkarten notgeld and in Germany spielkarten notgeld was issued between 1914 & 1923. See some of them in the scans below. in Germany, spielkarten notgeld issued between 1914 & 1923 include the towns of Bretleben, Leipzig, Lopischewo, Marienwerder, Roetzenhagen and Stralsund. 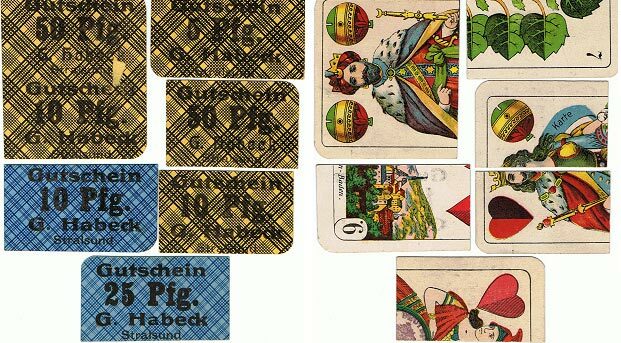 Above: these scarce serienscheine pieces were issued by Gustav Habeck from Stralsund, printed on the backs of playing cards, c.1921. They must have set up the printing plate, printed the money onto the playing cards and then cut them into seperate pieces. The pieces are different sizes, so the cutting was probably performed manually, possibly using a guillotine. 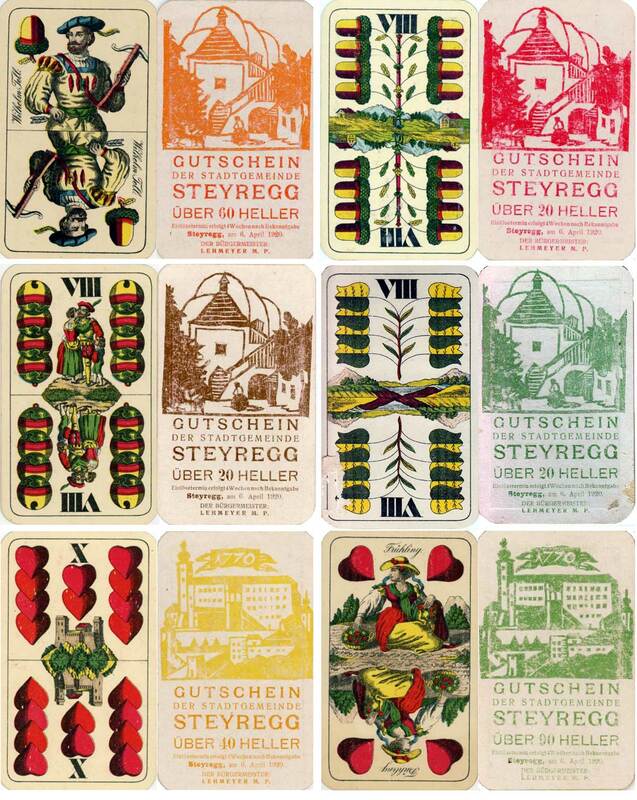 In Austria the towns of Steyregg and Reichental issued spielkarten notgeld made of playing cards in around 1920-1921. Others may also exist. Steyregg pieces had face values of either 10, 20, 30, 40, 50, 60, 80 or 90 heller. They were issued in several different colours with attractive woodcut illustrations. Above: spielkarten notgeld from Steyregg, c.1920-21. 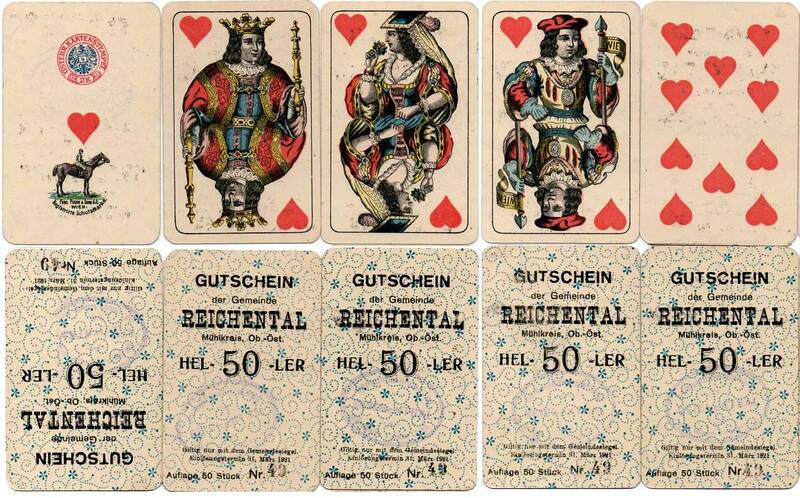 The notgeld playing card pieces of Reichental were a little different. They had a stampmark on them and an 'auflage' (issue number). Face values were for either 10, 20, 30 or 50 heller. All card suits were represented, with hearts being stamped with the 50 heller value, diamonds with 30, spades with 20 and clubs with the 10 heller value. 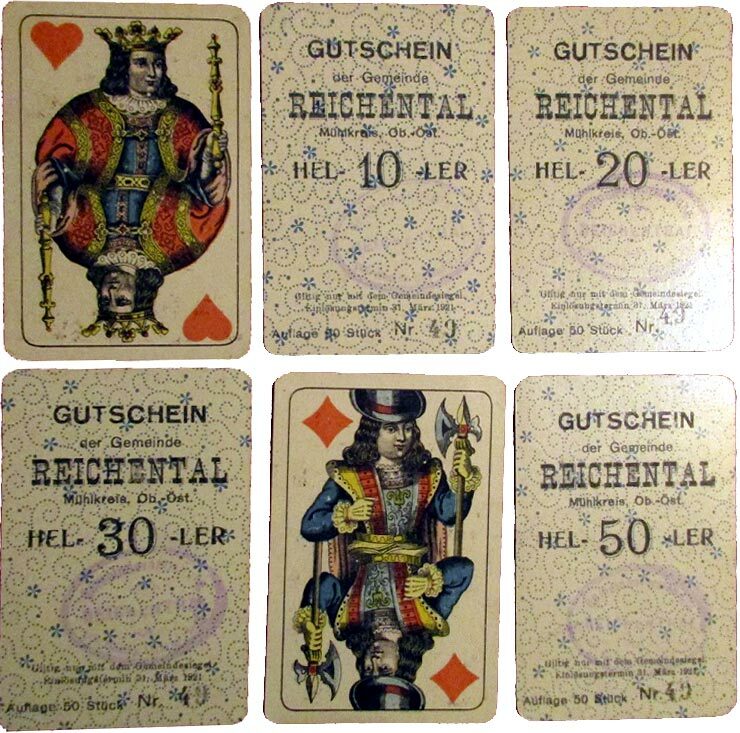 Above: Austrian spielkarten notgeld dating from 1920/21 issued in Reichental, printed onto cards made by Ferd Piatnik & Son. Instead of the face values being in German marks or pfennigs, the Austrian pieces have face values in heller or krone. The Reichental spielkarten pieces had an issue (auflage) of just 50 and these pieces come from set no.49. The notgeld issues of 1914 tend to be plainer looking than those issued after WWI. In 1914 there was a real 'necessity' for small change money. The later issues also met a need in the collecting market! 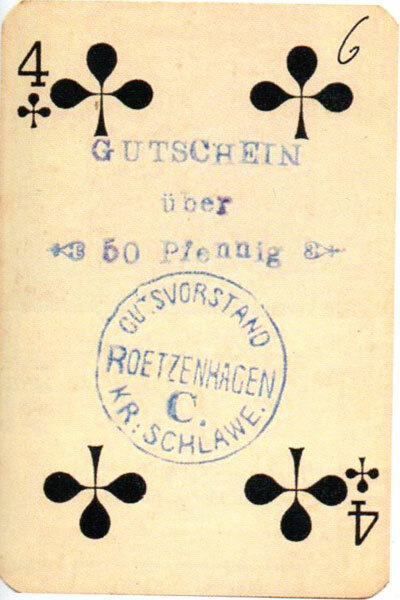 Above: ‘Gutsverwaltung’ notes were issued in Lopischewo (Polish - Lopiszewo) with no written date, although the date is known to be 8th August 1914. 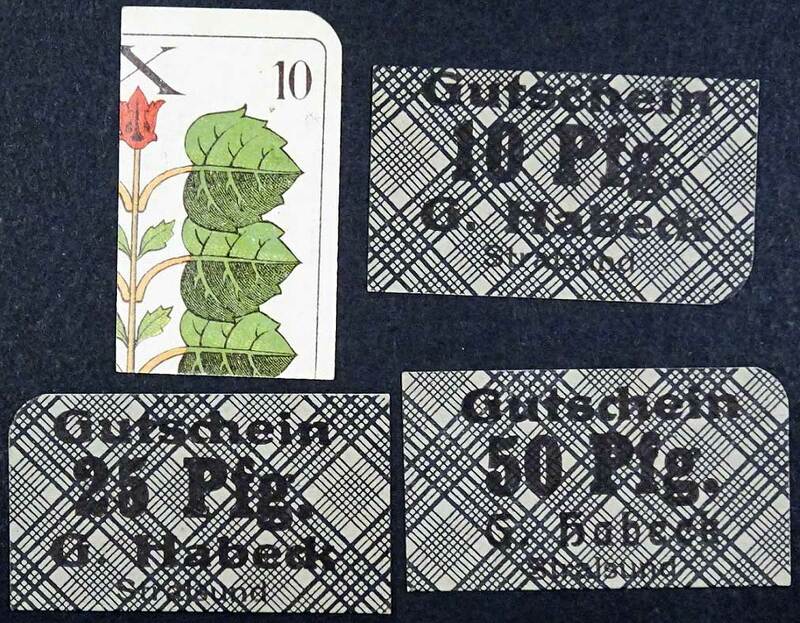 These ‘spielkarten’ pieces (made from playing cards) are extremely rare due to the very small numbers that were actually issued. They made 162 (81 marks worth) of the 50pf piece, 327 of the 1m piece, 164 (492 marks worth) of the 3m piece and only 99 (495 marks worth) of the 5m piece! The 50pf pieces are brown, the 1m pieces red, the 3m pieces blue and the 5m pieces green. They were all printed on either 'Hearts', 'Diamonds', 'Spades' or 'Clubs' ('Herz', 'Kreuz', 'Pik', 'Karo') - so there are 16 different pieces in total to collect. It is not known how many exist today. Thanks to Tony Gibbs-Murray for providing the inspiration for this page.